Used by thousands of people across the world, Purevision contact lenses are a popular ocular solution. Purevision contact lenses are often prescribed for the treatment of myopia and hyperopia. The lenses can easily be ordered online here using a prescription. 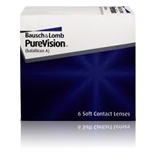 Purevision contact lenses are manufactured by Bausch + Lomb - a world renowned company with over a century's worth of experience in ocular solutions. Purevision contact lenses are made using the company's patented silicon hydrogel material which is capable of repelling dirt and has a higher moisture retaining ability. The lenses provide a comfortable fit and are designed to offer natural oxygen levels to the eyes, reducing the risk of irritation. 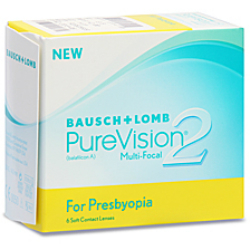 Purevision Multifocal Contact Lenses: Presbyopia is an ocular condition that is commonly associated with aging. Individuals diagnosed with presbyopia will find it difficult focusing on objects close to them or objects at a distance. This makes reading a book or using the computer a lot more difficult. Purevision Multi-Focal contact lenses can be used as an effective form of treatment. Purevision Near or Farsighted Lenses: Optometrists may prescribe Purevision contact lenses for people if they are discovered to have farsightedness (inability to focus on close objects) or nearsightedness. Patients diagnosed with any of these conditions can use standard Purevision contact lenses or Purevision 2 lenses with high definition optics. Purevision Astigmatic Contact Lenses: Designed for patients who suffer from astigmatism, these soft contact lenses are comfortable and sensitive to the curve of the eye. 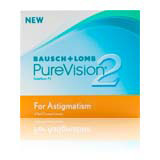 Purevision 2 for astigmatism is fitted with High Definition Optics which delivers clearer and more stable images. Another option is Purevision Toric Contact lenses. Purevision contact lenses may be worn continuously for as long as 30 days (even while asleep). However, this kind of use is not prescribed or suitable for everyone. For the right fitting, patients will need to consult with their optometrist. 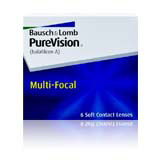 You can purchase your Purevision lenses here at www.contactlensesonline.com.au. We keep our prices low by minimising overheads commonly found at traditional bricks and mortar practices. We also provide receipts with your purchase to you can get health fund rebates easily. Purevision contact lenses are not toys. They can be used to treat several different ocular issues. Before using these lenses, it is required that people speak with their optometrist. An optometrist will be able to recommend the right brand and replacement schedule based on a patient's needs. Contact lenses should also be bought using the most recent prescription. Have an eye injury that may be aggravated by the lens. Suffer from certain allergies triggered by the ingredients used in the manufacture of the lens or the lens care solution. Are unable to wear, remove or maintain their contact lenses without assistance and have no one to help them with this. Extremely sensitive or dry eyes. While wearing Purevision contact lenses, unsettling environmental conditions should be avoided. Purevision contact lenses should be protected from smokes or fumes. Purevision contact lenses should also not be exposed to water in a hot tub or swimming pool because this may increase the risk of the wearer developing an eye infection. Hairspray should be applied before the lens is inserted. Purevision contact lenses are a solid option for people in the search for quality vision correction. 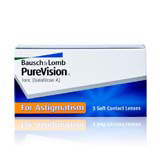 Purevision contact lenses can be used with patients diagnosed with astigmatism or nearsightedness. They can be worn while awake or continuously even while asleep for a maximum period of 30 days. It is vital that patients use their lenses within their replacement schedule. Using Purevision contact lenses beyond the schedule may lead to potential injury or infection.